Teeth differ in shape depending on their function & position in the mouth. On the inside, however, they all share the same basic anatomy. Crown: the visible, chewing portion of the tooth. Enamel: the hard outer covering of the crown of the tooth, it’s the hardest tissue in the body. Dentin: most of the tooth structure is this bone-like tissue which lies underneath the enamel and supports it. Pulp: the soft inner tissue that contains nerves, blood vessels and lymph vessels. 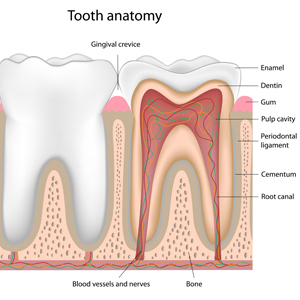 Cementum: thin, bone-like tissue that covers the root of the tooth. Periodontal ligament: connective tissue that holds a tooth’s root into the jawbone. Incisors: the eight front teeth, (top and bottom total) whose primary function is to cut into food when biting. They also help you pronounce words correctly when speaking. Premolars: also called bicuspid, these next teeth (8 in total) are wider, and have at least two pointed cusps used for crushing. Molars: approximately the same shape as premolars, but even bigger and stronger. They are typically the last teeth at the back of the jaw, and able to grind with astonishing strength. Wisdom Teeth: the very last molar on each side (upper and lower), these 4 teeth are often removed in adolescence or early adulthood when they threaten to disrupt surrounding teeth. Wisdom teeth also tend to be more prone to cavities and decay, since they are the hardest to reach when brushing and flossing.